The next generation of the popular Neo Ghost unit, the Phantom features a built-in magenet to ensure it's securely fastened in a convenient location. Preloaded with over 35,000 courses in more than 30 countries, no downloads and no membership fees ever. BUILT-IN GOLF CART MAGNET - the Phantom features an extremely strong magnet built-in to its sturdy frame fastening securely to the post of any golf cart! A MEMORABLE GIFT - Your loved one will be blown away! 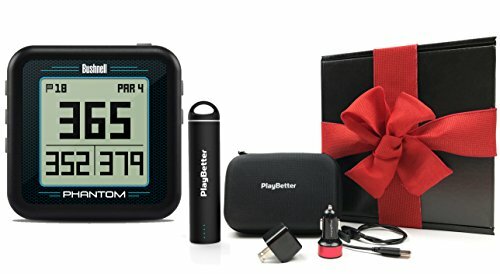 We worked hard to pick the most functional accessories for the Phantom - the PlayBetter Portable Charger and USB Adapters will ensure you're never without a charge on the course while the PlayBetter Hard Carrying Case will keep the watch in mint condition. All packed in a beautiful gift box with a red bow!